Nick Frydas (right) refights the Great War as the UK resident fights for Europe while in the US. Vince Frattali (right) gets schooled by John Wetherell as Pat Mirk and John Emery battle in the background. Dave Dockter (left) and Chris Byrd pair off for their postponed Final on Sunday as WBC winds down. The Monday start for the Guns of August pre-con was apparently to many people's liking with attendance up by a third. Chris Byrd, a rising star in the CDW universe, went through two former champs, (Nic Anner and Pete Reese) to get to the 2006 PoG Final. That took six rounds (42 hours of card crunching play) only to come short against a third champion. Dave Dockter won the die roll and bid 3 for the AP. He played Guns of August and went for a Western Strategy. Serbs weren't knocked out befoe Limited War (Turn 2). Dockter brought Italy in Turn 3 before any Allied troops on the border - something he never does - but, the CP was not on the border either. I SR'd a French army into Verona (space south of Trent?). Got lucky - very lucky - the 50/50 do or die die roll resulted in a trench on the first attempt. On Turn 4 Dockter had Russian CAU army in his hand - along with cloak & dagger. He played that first to reveal that no Kemel was lurking and then brought in good ole Yudenich. He managed not to get flip'd on first attack on the fort. On the second attack he took the fort, but got flipped. Bulgaria entered then. No German corps were going to the Near East since Serbs and Italians blocked the path. Turn 5-6: CP beat AP to total war by one turn - and it was a race to get Turkish armies and Sinai in the battle for the Near East. CP won that race and eliminated the Russian CAU army. Mid game witnessed the Germans forced out of the West into a Wixson/Hassard Defend the Rhine strategy, mucking about in the Balkans and Near East and the Russians moving forward. Late game. American's arrived - one of their armies ended up holding a critical hex in Italy to fend off a late CP surge. Russian front was very static - no Tsar would be taking command. AP grinded the CP in their 3 space double trench line - keeping the pressure off the Russian ally. Game ended with VPs at 10 - an Allied victory. 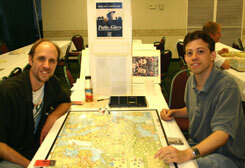 PATHS OF GLORY CHAMPION: Tom Drueding was the last man standing in a field of 64 competitors in BPA's third POG PBeM tournament. 135 games were logged in all, before Tom defeated the defending champion Stephan Valkyser of Germany to claim the championship and top laurels. Past champ Stefan Mecay of TX finished third, followed by Peter Reese (VA), Chris Byrd (CT) and Holger Janssen (Germany) respectively. Chris Byrd won his first PoG gold ring at WAM V in January 2007 over a field of 17 which included four former PoG champions. 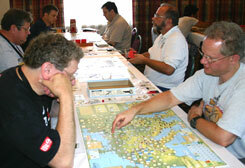 The field was swelled by a few qualifying games of Barbarossa to Berlin as well. Highlights included Michael Mitchell's Trench Digging Russians building seven trenches in ten attempts against poor Charlie Hickok. In the first round, Four sharks (three former PoG champions and Mr.Byrd) were paired against each other in the first round to cut the losers loose to pursue other wood (a WAM tradition). Byrd defeated Mr.Drueding, and then Scott Moll to advance to the semi's, while Nick Anner lost an early game to Dave Dockter. In the other semi game, Dockter (AP) defeated Castlebury's CP's early blitzkrieg in the East to try to get the Tsar off. The Final was a rematch of this summer's WBC climax with a different result as Byrd's CP defeated Dockter (AP - bid of 3 - AP wins ties). The game went the distance - decided on turn 20 - and VPs were razor thin. Chris played Guns. Tried a probe in the West, but AP held its ground. CP did clean out Balkans early (Putnick was AWOL this game). There was pressure on the Austrians in the east, but not enough to prevent a blitz against the Italians and their many French and British armies (who demonstrated a profound lack of gardening technology - missing the "magic" trench). CP then took most of Italy, but not Rome and the heel of the boot where the Italians and a lonely French army cracked the code on using shovels. During theis time, the CP was pushed into defending Rhine and the trench happy Russians stopped the Germans and their lackeys in the East. The Near East was quiet most of the game (CP drew Bulgaria and Kemel first draw of Limited War), until very late when sloppy Allied leadership and strong CP play resulted in the Russian Army of the Caucasus getting OOS'd while attempting to defend the poor Brits in Iraq. About that time the Russian horde lunged forwarded under Brusilov and hammered the Austrians manning the mountain line. Romania entered very late, and the Allied HQ again allowed two Russian armies to be OOS'd. That, coupled with the turn of events regarding our old friend Yudenich, set up a nail biting Turn 20 in which there were a series of trench battles in the Austrian eastern VP, Polish VP and Konisberg to decide the game. The Russians lost them all, and, the game. Chris took home his fifth BPA championship wood and 2nd-6th place laurels laurels were apportioned to Dockter, Michael Mitchell, Melvin Casselberry, Tim Miller and Scott Moll in that order.